Stornoway Harbour is the main port within the Outer Hebrides, the islands on the Western frontier of Europe. Historically one of the busiest fishing ports in Europe, this location has extensive engineering and maritime experience and is desirably located within closest proximity to any future Atlantic developments. The site benefits from daily air-links to Manchester, Aberdeen, Glasgow, Edinburgh and Inverness, and has progressed into one of the leading commercial ports in the North West. 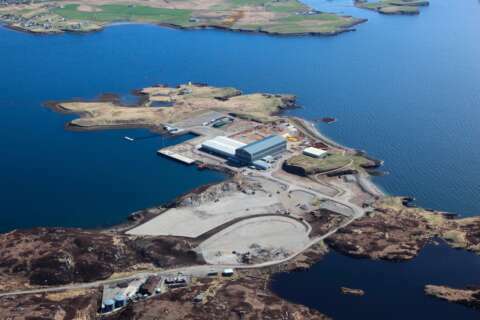 Expansion of Stornoway Port in the late 70’s led to the development of the Arnish fabrication yard; a key strategic multi-sectoral site, which is investor ready and offers a manufacturing, assembly and deployment hub. Arnish features a heavy lift pier, 3000t load out capacity, significant laydown opportunities, and an internationally recognised tenant, BiFab - who are currently using the facilities for the fabrication of jacket substructures and piles for the Beatrice Offshore Wind Farm. Due to its strong engineering experience and its location next to potentially exploitable offshore wind, wave and tidal resources, the Port -including the Arnish site - has the capability to host further renewables related activities as well as offering real potential in laydown, assembly and O&M for the offshore energy sector. Contact Port Authority for further information. The recently published Stornoway Port Masterplan includes plans to further develop the Port, including the construction of deep water berthing and storage facilities for the Energy and Tourism market. The first phase plans also include a large heavy lift platform together with approximately 15 hectares of additional storage area, with the flexibility of further increasing both berthing and laydown areas, should the full potential of the site be realised.